Qmani have developed an advanced Web-based platform, smsQ, that will provide powerful features that allows you to use SMS in your corporate messaging and workflows. Simply send SMS using your PC! It can be used immediately, without any changes to your PCs!! Just use smsQ for immediate benefits and it can be on every PC in seconds . 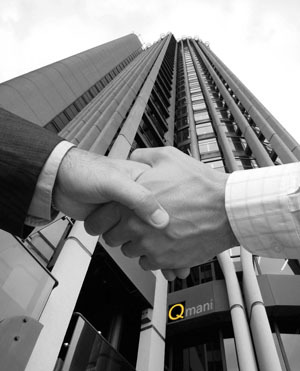 Anywhere, Anyone, Anytime, Always get connected with Qmani. Not providing your desktop users with an effective messaging tool? Bothered by the money spent on Calls to Mobiles, sending mail advices that don't get there timely, playing "mobiles (telephone) tag"? Concerned about Clogged Email Inboxes? Another Virus Attack? Tired of leaving messages that are never returned? The User screens implemented for smsQ is simple to understand, easy to use, yet has powerful features. Sending multiple messages is quick and simple, with mobile numbers easily extracted from your own documents, Excel spreadsheets or databases. The list is simply uploaded onto smsQ and then the messages are sent when required. You can also store your mobile numbers on your own Address Book, and send messages via a point-and-click on your mouse. But if your needs demand different messages to different mobile numbers, simply take advantage of our quick to use 'Template SMS' or 'batch' feature for sending personalized mail-merge messages. If your needs are enterprise-wide and high-volume, we can fully integrate smsQ into your business systems. With our enterprise solution, you can deploy our smsQ right inside your datacentre behind your firewall. This will blend transparently into your Intranet and your business applications will be enabled to send and receive SMS messages in no time. The smsQ platform can integrate this into your daily workplace and business activities. Use either or powerful smsQ product or if required, Qmani can customize specify functions that you require in a cost-effective manner and with quick delivery of your soltuion.